Modest Monday (Little Girl Edition!) and a Link Up! Since we were celebrating Deborah’s 3rd birthday, I asked Sean to just snap a picture of her that I would share. This is a classic Deborah look. She looks very serious, but as those who are closest to her know, this serious look is full of joy. She can be full of smiles and giggles, and never ceases to make us all laugh! I love her little outfit. 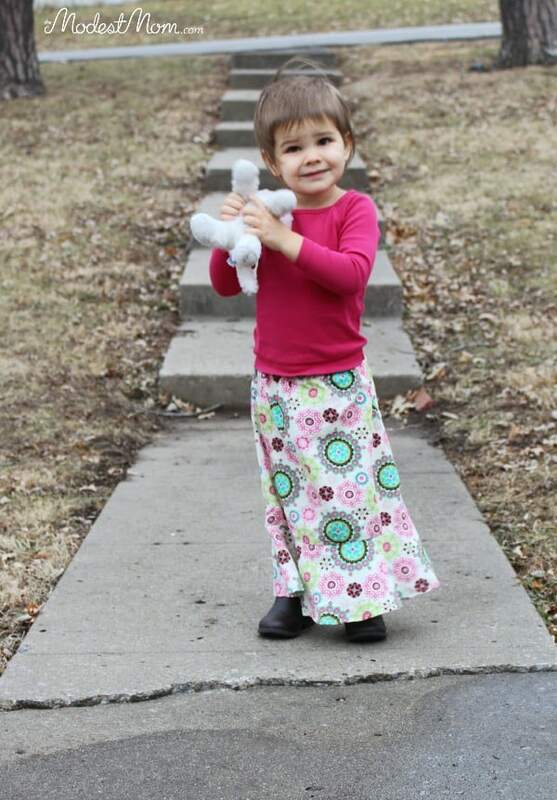 I sewed this skirt quite awhile ago, it probably was for our older daughter at the time! It was crazy that I never got it finished, there was only one small thing left to do on it. My sister saw it sitting in my pile the other day and took it home, saying she would finish it. The next day it was done. So thankful for a sweet sister! Her shirt is a Tea brand shirt I found on ThredUP. I get most of the girls shirts from ThredUP, thanks to credit I earn. I like getting them shirts from Gymboree the most, as they seem to hold up really well and can be passed down. The boots are so adorable, you can’t see them very well in this picture. My dad and step-mom gave them to her for Christmas. They are from Kohls and are on sale right now! « DIY: Make Your Own Liquid Hand Soap Tutorial! 14 Comments on Modest Monday (Little Girl Edition!) and a Link Up! Deborah is so adorable! I agree about Gymboree clothes, they hold up very well. So adorable! Thank you for hosting! Your little girl is too adorable! Nice skirt. Your daughter is LOVELY! She put a smile on my face today! Thanks for the opportunity to link up here! Happy Birthday to your sweet girl! I love the skirt.. Thanks for hosting this fun linkup!